Complete silence, peace & quiet. Magnificent panoramic lake view. Lake 100 m.
kayaking, biking, swimming and fishing – or just relax. Activities: By the lake you will find different restaurants and picnic sites as the area is a quite popular excursion spot. Here you have the option to do different water sports such as kayak or canoeing. You can even fish in the lake, we have a couple of fine fishing rods for free disposal. Do you enjoy walking or mountain biking you will find several marked walking paths across the fields. And the mountains behind our finca have some of Spain's best possibilities for mountain climbing. Paragliding and Repelling is also very popular. The beautiful lakes and the amazing mountains are just outside the door of your holiday apartment. Kayaks and water bikes are rented out at 3 different places by the lakes. Here you also find different picnic places where you can enjoy yourselves for a whole day. Paragliding points are only 1,5 km. from the finca and the mountains behind gives you some of the best climbing or rappelling challenges in Spain. Also endless kilometers of hiking and biking routes. Nature: The nature reserve by our finca is called Desfiladero de los Gaitones and has an area of 2.016 hectares situated between the municipalities of Ardales, Antequera og Alora. The area is characterized by its many funny and fascinating stone structures which have evolved through thousands of years by water and wind. A dramatic and lovely tourist attraction is La Garganta del Chorro; a 3 kilometer long and 400 meter high gorge, which connect the three lakes; Embalse de Gaitanejo, Embalse del Conde de Guadalhorce og Embalse del Guadalteba-guadalhorce by the river Guadlahorce that runs to the coast of Málaga. The area's flora is a true pleasure for everyone. There are lots of aromatic pine, eucalyptus, olive, oak tree, cactus and cypress. Smaller vegetation as rosemary, thyme, wild roses and different flowers make small bushes up to 40 cm high. No matter the time of the year the nature is always covered in the most beautiful colors and the air is fresh and clean. Culture: El Arpa is close to Malaga and some of the World's most appreciated cultural treasures such as the impressive Alhambre Palace in Granada, the big Moorish mosque in Cordoba with the beautiful columns, La Giralda cathedral in Seville and not to forget the bullring and the impressive bridge in Ronda. Malaga has been going through a huge development both cosmetic and cultural during the last 10 years. In 2003 the opening of the impressive Picasso Museum took place and today it exhibits more than 200 pieces of his art. Also a visit to the village museum by the Alcazaba-Gibralfaro- fortress and the roman theatre is very interesting. Picasso's native home and the magnificent cathedral. Or maybe just a walk through the city with all its life, small alleys with busy coffee bars and modern shops on the renovated main street Calle Marques de Larios. Everywhere lots of life and joy. Antequera is a very historic city and the city with the highest amount of churches per inhabitant in Spain (200). We are a Danish couple and came already in the early 1990's to Andalusia, where we left our hearts. Back then we worked as tour guides and after having been around Europe we returned more than 10 year ago and have been living and working here since then. We bought and restored the old Andalusian farmhouse 'El Arpa' in The Lake District of Malaga, where we let apartments to hikers, birdwatchers and other nature lovers - and we live here ourselves. Panoramic views over the lake. Even lake views from your bed! The apartment is with a well-equipped kitchen with four-burner hob, fridge with freezer and dining set for four people and an equipped bathroom with shower. To make your arrival comfortable we provide you with a little welcome pack to make your first day easier. The apartment has its own private entrance and in fronts a little patio or terrace with a barbecue to make your Spanish nights unforgettable. 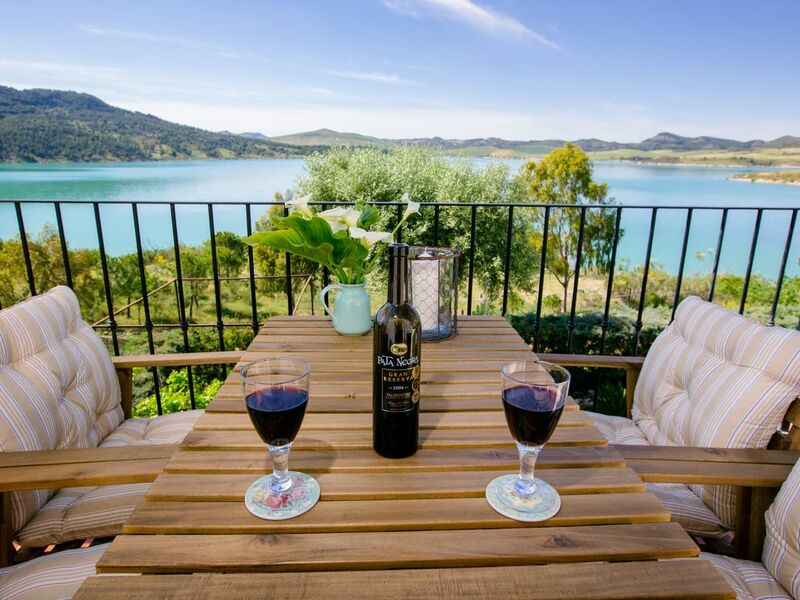 While enjoying the beautiful view over the lake you can make tasty grilled meat or vegetables on the barbecue and not to forget the taste of the delicious Spanish wines. Just outside your apartment we have made a little herb garden and you are more than welcome to use a tuft of tasteful Rosemary or Oregano in your dinner. Myself and my partner had a wonderfully peaceful 9 days at El Arpa finca. Situated in the mountains just outside Malaga with private access to a lake, it is the ideal location for a quiet getaway. We felt well looked after both before and during our visit - the hosts were always easily contactable and went as far as to suggest activities and local restaurants that we may like to book before our holiday. The apartment itself was neat and tidy. It was clean and had everything we would need, and included a welcome bottle of wine and tostadas (thank you!). We were impressed with the effort the hosts are making to offer environmentally friendly accommodation, and think the store room is a great idea as it is not easy to quickly nip to the local shops. The room was homely and in keeping with Spanish tradition. It is not a “new build” type of accommodation, which is perfect for us as we like to stay places that have a bit of character. For those seeking a 5* luxury hotel this probably isn’t the right place to stay, but be assured it was certainly beautiful, charming and kept very clean. The location of El Arpa is very tranquil. The other people staying in the apartments were respectful of each other and as the apartments are for 2 people maximum the atmosphere during our stay was calm and relaxing. The apartment had a fan, which was much needed in the Spanish summer heat! And mosquito repellent. But no air conditioning, which was ok as the evenings were quite cool. There was a book filled with lots of information and suggestions on places to go during our stay and we did visit several places based on these suggestions. The surrounding area is perfect for people who like exploring; although having a hire car is a must. We were busy most days and would still come back to explore more. There are several national parks within an hour or so driving. We also went rock climbing, visited the local wolf sanctuary, went quad biking and of course visited the caminito del ray - so there is plenty to do! But El Arpa is also a perfect place to stay and relax during the day for those wanting to wind down. All in all, we can't speak highly enough of El Arpa, we had an amazing holiday and would happily come back in the future. We also felt the price was very reasonable, hence why we were able to stay for 9 days instead of a week. Thank you to Rikke and Michael for being so accommodating and kind and providing such a lovely place for people like us to enjoy :). We thoroughly enjoyed our stay at El Arpa. The old farmhouse is located in the middle of nature without a house in sight. The view from the terrasse is wonderful and it is only a 2 min. walk to take a dip in the lake in front of the house. There are lots of beautiful walking trails nearby and also some nice restaurants within short driving range. After a week we felt refreshed and energised. Thank you to Rikke and Michael for their hospitality and greetings to Hugo too. Wir hatten 10 wundervolle Tage in der Finca El Arpa. Sehr liebenswerte Gastgeber, die sich um die Bedürfnisse iher Gäste bemühen. Wir waren mehr als zufrieden und können die Unterkunft nur empfehlen. Vielen Dank, Aline. Bis zu nächstes Mal! Es war alles super auf EL ARPA....Lage, Ausstattung, alles sauber und vorhanden, sowie klasse Empfangskorb mit leckeren Sachen, ruhige Lage, nette - sich um Alles kümmernde , betreuende - Vermieter! Guter Ausgangspunkt für viele spannende Unternehmungen, wie bspw. Caminito del rey, El Torcal, Vogelbeobachtungen, Wanderungen oder die hinterm Haus liegenden Felsen mit ihren Geiern. Wir empfehlen El Arpa an alle Naturliebhaber wärmsten weiter! Ein wunderbarer Ort in paradiesisch schöner Landschaft, eine Sicht von der eigenen Terrasse, die zum Träumen einlädt, ein See, den man beim Schwimmen meistens ganz für sich hat, eine Stille, die einem zu sich kommen lässt, ein Sternenhimmel, der einen vom Schlafen abhält, eine Unterkunft, die äusserst liebevoll und sehr praktisch eingerichtet ist, zuvorkommende und herzliche Gastgeber, bei denen man sich rundum willkommen fühlt: El Arpa war DAS Highlight auf unserer siebenwöchigen Reise durch Andalusien! Uns hat es super gefallen. Man schaut von der Finca und der Terrasse direkt auf den schönen See. Mit dem Blick kann man frühstücken, auf bequemen Liegestühlen entspannen, Abendessen, den Sternenhimmel anschauen, ... Rikke und Michael sind top Gastgeber, hilfsbereit und entspannt. Die Wohnung ist gut ausgestattet mit allem was man braucht. Vor allem die Küchenausstattung fanden wir super, da wir häufig selbst gekocht haben. Es gab sogar eine Mokka-Kanne für den Herd. Sehr nützlich war außerdem das kleine Nahrungsmittel-Warenlager, das zur Selbstbedienung angeboten wird. Dort kann man Getränke wie Wasserflaschen, Cola und Bier und Wein zu guten Preisen kaufen. Auch nicht verderbliche Nahrung wie Nudeln, Saucen, ... sind dort zu haben. Abgerechnet wird einfach bei der Abreise. Direkt am See stehen Sonnenliegen und man kann sich auch super darin erfrischen und schwimmen. Die Gegend um die Finca herum hat mit den Stauseen, einem sehr schönen Wanderweg in / um die die Berge an der Finca herum mit tollem Panorama auf alle drei Seen, dem Camenito del Rey auch sehr viel zu bieten. Die Ruhe an der Finca tat ebenfalls sehr sehr gut. Wir können sie also für alle, die einen idyllischen Platz zum Herunterkommen suchen nur allerwärmstens empfehlen! Our finca is situated near Ardales and El Chorro, this area is a true Mekka for nature lovers and outdoor enthusiasts, no matter age. The lakes are divided into three different lakes called; Embalse de Gaitanejo, Embalse del Conde de Guadalhorce and the biggest of them all Embalse del Gualdalteba-Guadalhorce, which is the one in front of our finca. By the lake you will find different restaurants and picnic sites as the area is a quite popular excursion spot. Here you have the option to do different water sports such as kayak or canoeing. You can even fish in the lake, we have a couple of fine fishing rods for free disposal. Do you enjoy walking or mountain biking you will find several marked walking paths across the fields. And the mountains behind our finca have some of Spain's best possibilities for mountain climbing. Paragliding and Rapelling are also very popular. The neighboring villages are Alora, Antequera, Pizzara, Bobadilla and Campillos. El Torcal is also nearby. Other Activities: Rock climbing, canoing, kayaking, hiking, rappelling, arch shooting, etc. Golf: 60 golf courses in Andalucia - Antequera Golf is the closest (30 km).